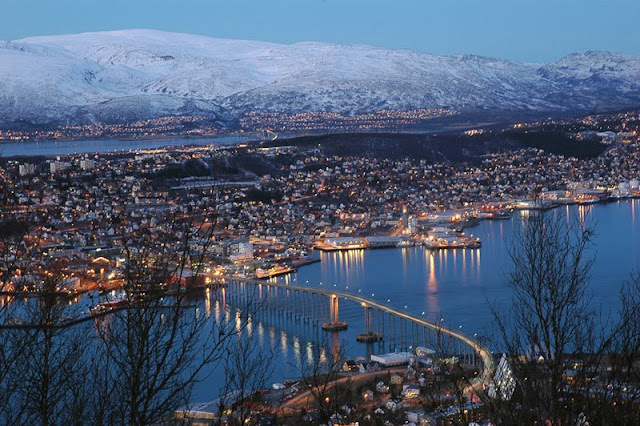 I have wanted to visit Tromso in Arctic Norway for some years now, since first seeing it on ITV in the programme "Conquer The Arctic". In this programme, teams of two from various countries were challenged to 5 days of survival in the Arctic Circle, while taking part in a series of physically demanding challenges, involving cross-country and downhill skiing, shooting, an assault course, ice climbing and a mountain marathon, in competition for the Goretex Trophy. One of the challenges was to abseil 180 feet from the Tromso bridge into waiting canoes, before paddling off to face other tests of endurance and the final event was a mountain marathon, taking them up, over and down Mount Tromsdalstind above Tromso, a distance of around 15 miles. It was the images of this - the brilliant blue sky and dazzling white snow - which inspired me to want to see it for myself. A little later I chanced to read a book entitled "We Die Alone" by David Howarth. This told the incredible, almost unbelievable, story of the efforts of Jan Baalsrud, the sole survivor of a team of Norwegian special agents, to escape from German-occupied Norway to neutral Sweden, after their raiding party was destroyed. The physical and mental hardships that he endured before finally making it to safety were incredible. 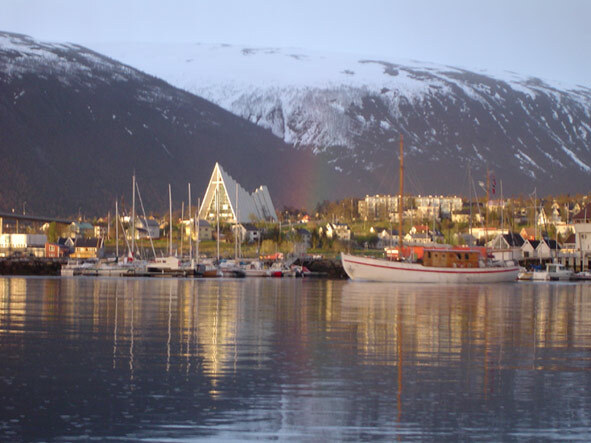 This also took place around Tromso and further added to my desire to visit this amazing area. So in 1998, after 2 cross-country skiing holidays in Norway with Waymark, we were ready to go for it. Ironically, both holidays were based at Kvittavatn near the town of Rjukan in Telemark, itself the site of a famous World War Two episode, namely the raid on the heavy water plant immortalised in the film "Heroes of Telemark". Tragically, just over a month before we were due to leave, our motor caravan was stolen and we had to cancel the holiday. I was bitterly disappointed and what I wished on the perpetrator is unprintable! However, eventually the insurance company paid up and we were able to buy a new motor caravan. So it was that we found ourselves, on April 13th this year, aboard the ferry bound for Stavanger. The crossing was very rough and both of us were seasick - not a good start - but by the time we landed at Stavanger we were feeling better and on our way at last. Our outward route took us along the southern coast of Norway to Egersund, before turning north up Setesdal towards our first ski centre - the aforementioned Kvittavatn in Telemark. When we were there previously with Waymark, the owners, Trevor Dowe and Marianne Folmer, had said that we would be welcome to stay with our motor caravan and use their facilities. We had a very good day's skiing here, despite the season officially finishing after Easter, although we knew that the snow lasted until at least the end of May. We then headed northeast to Lillehammer, a resort known more for its downhill skiing as a result of the 1994 Winter Olympics being held there. However it has been a centre of cross-country skiing for many years, and the centres of Nordseter and Sjusjoen have an enormous network of marked trails and off-track routes, as well as long-distance races, such as the famous Birkbeiner, which covers a distance of over 50 km. Heading north, we managed a day's skiing at Oppdal, another alpine/nordic centre, as are most of the Norwegian ski centres, before moving on to Otta. Unfortunately, the weather here was against us so we abandoned the idea of skiing and continued our drive northwards. From Otta we followed the E6 road, the main north-south road in Norway, which runs from Svinesund on the south coast, right up to Kirkenes in the far north, a total distance of 2657km or 1680 miles! This was the start of several long days of driving. 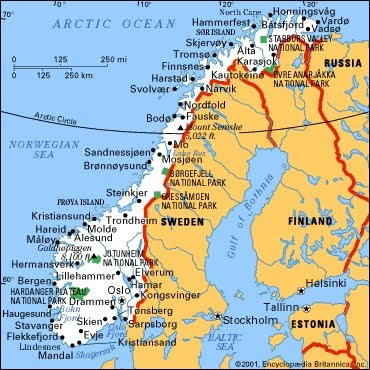 Our route took us through Trondheim, into the Arctic Circle (660330 North), past the Arctic Circle Centre (altitude 650 metres) and on through Fauske and Narvik to Tromso. On the way we passed through some of the most spectacular mountain scenery that I have ever seen and it just went on and on! Many of the roads in Norway run in tunnels, and in one day we drove through 17 - the longest being 3.9 km. These tunnels are not all straight - some climb then descend, others have many bends in them - so that the scenery is constantly changing from one side of the tunnel to the other. The other main features of Norwegian roads are the ferries across the fjords. These give you a welcome break from driving and allow you to enjoy the spectacular scenery in comfort. My enduring memories of this part of the trip are of jagged, snow-capped mountains, mirror-like fjords, lush green Scots Pine forest, millions of birch trees and multicoloured mosses and lichens. We also saw wild reindeer and arctic foxes, just at the side of the road, which seemed totally unperturbed by the traffic! The weather in Tromso was not too good, but we managed to see everything that we wanted to see -the bridge, scene of the abseils, and Tromsdalen church with its magnificent stained glass window, its spiky modernistic shape blending in remarkably well with its surroundings. We also went up in a cable car to view Mount Tromsdalstind but unfortunately it was too cloudy on top to see it. We rounded the day off with a visit to Mack's Pub, the most northerly pub and brewery in Europe, where I enjoyed a pint of Arctic Beer. Leaving Tromso, we headed for Lyngseidet and Lyngen Fjord, the area where the epic wartime survival episode took place - it looked very little different from the photographs in the book taken 45 years ago, and on south to Innharvet. This part of the trip involved 3 ferry crossings. From there we headed back to the Arctic Circle Centre, through another 20 tunnels in 1 day, where we had a magnificent day's skiing. That night we actually camped at the centre. While here we saw ptarmigan or capercaillie (I am not sure which) in their white winter plumage. Continuing south, we had another great day skiing on Vestefjell, drove through our longest tunnel yet -(5.9 km) - and saw an elk! We had been seeing warning signs about wandering elk virtually since Day 1, but never dreamed we would actually see one, although we always hoped we would! Our homeward route then took us towards Alesund on the west coast, again using 3 ferries, before heading south for the fjord country through 3 even longer tunnels, 6-8 km in length. The highlight of this part of the trip was a visit to the Norwegian Glacier Museum at Fjaerland. 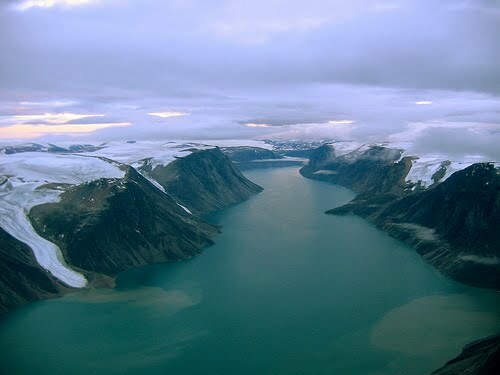 This is situated below the Jostedal Glacier, the largest and fastest-moving glacier in Europe. Here I watched a 5-screen, surround-sound film of a helicopter trip to the top of the glacier and back, which left me totally awe-struck and virtually speechless with emotion, before looking at the other exhibits, including a very realistic mock-up of a trip into an ice cave under the snout of the glacier. We continued south, past Sognefjord, the longest and deepest fjord in Norway and over Vikafjell to Voss, another of the Norwegian downhill resorts. Over the top of Vikafjell we were driving through 20 feet high snowbanks on either side of the road for several miles! The snow in the Voss ski area was not skiable and in any case Voss was closed - it being May Day - a bank holiday in Norway. From Voss we travelled to Bergen, breaking our record for tunnels - 37 in one day! Our final day in Norway was spent in Bergen where we had our first meal out, having spent the morning looking round the city. I was very impressed with Bergen - it was a lively place with lots going on and plenty to see. The highlight was the Bryggen, a collection of old timber warehouses dating from the Hanseatic Era (1340 - 1750), which had been preserved and used as shops, restaurants and boutiques etc, down by the old harbour area. We also saw Staatsrad Lemuhl, a very large square rigger which is used as a sail training boat, and whose home port is Bergen - she was very impressive and I wish I could have seen her under full sail. So we finally arrived back in England, after a much smoother ferry crossing, having had 3 incredible weeks and covered 3300 miles - an experience which will live long in my memory. Hi Martin, I have read with interest your trip to Norway as I am thinking of doing the same thing at the end of this year. Can you offer me any advice. Have a nice journey, good luck!